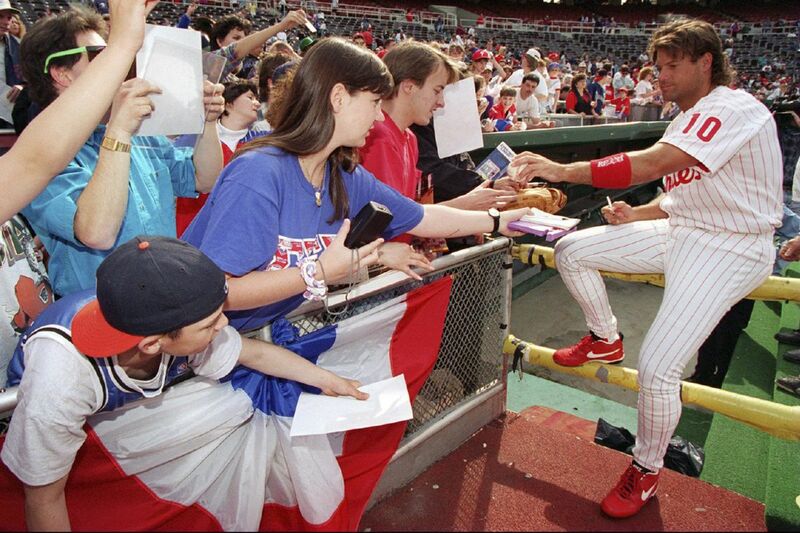 Darren Daulton signs autographs for fans on the first base side Veterans Stadium. How did Darren Daulton get the nickname "Dutch"? Friends, fans, and fellow teammates mourned the loss of the Phillies great, who died Sunday from the brain cancer he had been fighting for four years. Many former teammates, such as Lenny Dykstra, simply referred to Daulton as Dutch, a nickname he went by during and after his career in Philadelphia. It turns out Dutch is a moniker Daulton earned long before he joined the Phillies. Danny McAleese, then a student at Our Lady of Calvary School in Philadelphia, asked Kids' Talk writer Linda Harris in the Oct. 7, 1993 edition of the Inquirer how Daulton earned the moniker. "Darren Daulton was born in Arkansas City, Kan., in 1962. When he got old enough to play with the neighborhood kids, they played a jump-rope game called Double Dutch. Because Darren's initials were D.D., and the game's initials were D.D., the kids began calling him Double Dutch. The name stuck, but the "Double" got dropped along the way." As Harris noted, the "double" part of Double Dutch still suited Daulton. During the 1993 regular season, Dutch hit 35 doubles, setting a Phillies record for a catcher. Daulton actually hit more than 30 doubles three times during his Phillies career before injuries began to slow him. Dutch wasn't his only nickname. Teammates such as John Kruk often referred to him as "Bubba," which Daulton said on his former website was "because of his unique leadership capabilities."